M: Henry V. Clements, Jr.
Edna Louise Henshaw1,2 [Louise Henshaw3,4,5]. 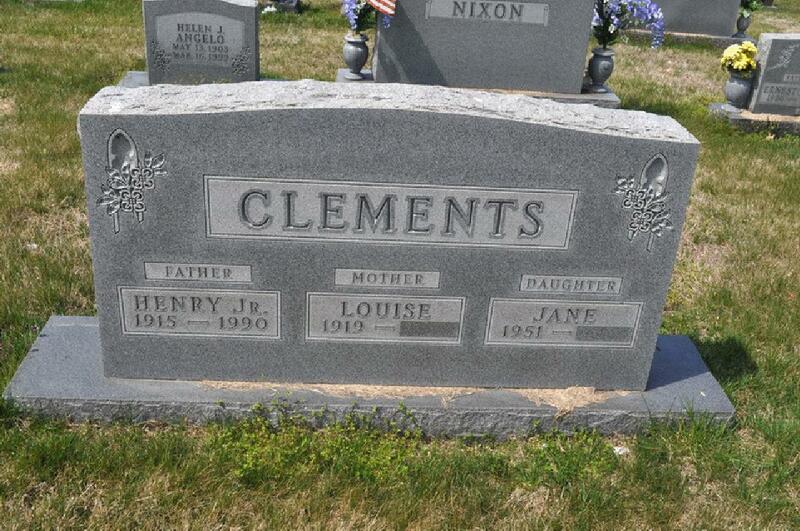 Jane Louise Clements, born Dec 18 1951, Union County, Kentucky. Joyce Marie Clements, born Aug 10 1955, Henderson County, Kentucky; married Richard Gruenewald. Donald Henry Clements, born Feb 7 1962, Henderson County, Kentucky; married Ellen --. Louise Henshaw Clements, 95, died Saturday, December 27, 2014 at her home. Survived by children, Jane Clements, Joyce Gruenewald, Don Clements; sisters, Dorothy and Margaret Thomas, Helen Ray. Funeral 10 a.m. Monday, December 29, 2014, at St. Ann Catholic Church. Visitation 3 to 7 p.m. Sunday with prayers at 6:45 p.m. and 8:30 a.m. until service time Monday at Whitsell Funeral Home in Morganfield, Ky.
Louise Henshaw Clements, age 95 of Morganfield, KY died on Sat. 12/27/2014 at her residence. She was a member of St. Ann Catholic Church. She was a 4H leader and a member of the Union County Homemaker Club. She was a retired school teacher who volunteered at St. Ann Parochial School and St. Vincent Depaul. She enjoyed needlepointing and spending time with her family. She is preceded in death by her husband, Henry Clements, Jr.; parents, Lester and Edna Henshaw; 3 brothers and 2 sisters. Funeral service will be 10AM Mon. 12/29/2014 at St. Ann Catholic Church in Morganfield. Fr. Freddie Byrd will officiate. Burial will be in Odd Fellow Cemetery. Visitation will be 3-7PM Sunday with prayers beginning at 6:45PM and 8:30AM until service time at Whitsell Funeral Home in Morganfield. Memorial contributions can be made to St. Anthony's Hospice or John Paul II Catholic School. 1920 census, Magisterial District 1, Union County, Kentucky; roll T625-600, ED 120, page 11B, line #75, dwelling #139, family #139.